Do you need to regain your balance? Try star anise tea and drink your way to health and longevity one cup of tea at a time. Find out today how you can enjoy this tea in a safe way and reap the many wonderful health benefits this tea has to offer you. It is time to take this culinary spice out of the pantry and into your cup! This beautiful little herb is called illicium verum in Latin and goes by the common names star anise, star aniseed or Chinese star anise. Native to Asia, this is an evergreen tree that grows from northeast Vietnam to southwest China. This tree can reach from 2 to 5 meters in height, and it is the star shaped fruits that hold the wonderful seeds to make this tea. There also exists a Japanese variety of star anise, illicium anisatum in Latin, which is not edible and can be highly toxic. Its sole purpose is to be burned as incense. Be careful not to mix the two species. This oriental herb has long been used in traditional medicine due to hidden healing powers, and at the same time it has a very strong presence in cooking all over the world. As a spice, it is an ingredient in the traditional Chinese five-spice powder and you can find it not only in Chinese dishes, but also in Indian, Malayan and Indonesian cuisines. It is great to enhance the flavor of meat dishes. 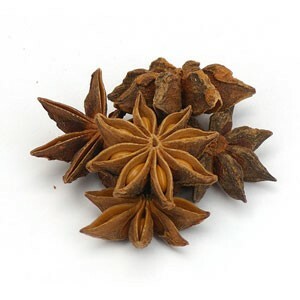 In the West, star anise seed and oil are both used, either in baking, as a replacement for anise (pimpinella anisum), or in the production of liquors. But that’s not all! Star anise oil is used in the cosmetic industry, from exquisite perfumes to something as simple as toothpaste. So, without even knowing it, you may be in contact with this exotic herb on a daily basis! More importantly, star anise seeds are used in the making of an herbal tea that is full of benefits, so welcome the benefits of star anise tea in your life. In star anise, you will find linalool, a compound that is full of antioxidants that help to improve your health in the many ways seen below. Also these little seeds are rich in anethole, which gives them a flavor very similar to that of anise. For men: this tea can be considered much like a male tonic, providing health, well-being and increasing sexual drive. This tea may be great for you if you are feeling particularly tired, depressed and having sexual problems. For women: star anise tea has a mild estrogenic effect, so it can help you in many stages of your life. From promoting menstruation and helping you through the symptoms of premenstrual syndrome, to regulating you cycle. This is a tea that can help you after childbirth by stimulating lactation, helping you to breastfeed your baby. And at a later stage, star anise tea may help you fight the symptoms of menopause and increase libido. Sounds appealing, doesn’t it? If you are prone to getting sick as soon as the cold season starts, then you will love star anise tea. It is a warm herb that has been traditionally used to help bring relief to the colds and respiratory congestions that keep you down. This is a tea that fights bacteria and viruses that are at the source of colds and flus and it helps to treat asthma, coughs, lung inflammation and bronchitis. Star anise contains shikimic acid, which is essential in the treatment of flu and is being used in the production of anti-influenza drugs. And because of its anti-fungal and anti-bacterial natures, star anise is going into cough syrups, lozenges and tea to act as an expectorant, fighting all sorts of coughs. Oh, the pleasure of eating and savoring each piece of food! Oh, the tragic indigestion that follows! Is this you? If you have difficulty in digesting your meals, this may be the tea for you. Star anise tea eases heavy digestion, relieving stomach aches. Feeling bloated? Well, drinking this tea helps to eliminate excessive gas and reducing intestinal spasms. This is also a great tea when you have lost your appetite. The herb makes your digestive system work better and revitalizes your whole organism and can be used as a natural breath freshener. And with the approval of your child’s pediatrician, this may be a great tea to give your baby when the little one is restless with painful colic. But make absolutely sure you are using Chinese star anise for your baby’s tea. Star anise is known for its antifungal action; this can be used not only for colds but to bring back balance to your whole immune system. This means that it can fight and prevent infections in the mouth, throat and genitourinary tract. With antioxidant properties, a cup of this tea can help your body to fight and dispose of free radicals that cause disease, namely cancer, through damage to your cells and DNA. The oil of star anise is also quite helpful of pain relief brought on by rheumatism and, in diluted form, to treat skin diseases. Stock up on Star Anise now! Star anise tea may be quite a safe drink as long as you are absolutely sure to make it from pure Chinese star anise only, and not contaminated with the Japanese toxic variety. If you start feeling irritated, nausea and even start vomiting and having seizures, stop taking the tea immediately, because it has most likely been contaminated. See your doctor at once and throw away your tea. ...you are pregnant or breast-feeding, it is safer to avoid this tea. There still isn’t enough information on possible side effects of this tea. So unless you have an absolute recommendation from your doctor, better stay safe and try other teas. ...you suffer from such cancers as: breast, uterine or ovarian cancer. Star anise tea has estrogen-like properties, meaning that if you have a disease that may be worsen by estrogen, than best avoid this tea for the time. Get your teapot and teacups ready and let’s learn how to make star anise tea. To make this tea you can use either leaves or the seeds of the Chinese star anise plant, though it is more common to use the seeds. Begin by boiling water for your tea. Once it is boiling, pour the water into your teapot. Place 1-2 whole seed pods per cup of water inside the teapot and let it steep for 10 to 15 minutes. Strain and sweeten with honey, adding to the healing powers of this tea if you are treating a cold or wicked cough. Now, just sit back and enjoy this spicy tea and feel its soothing action do away with your troubles. Drink it up to 3 times a day, preferably after each meal to help soothe your digestion. This is a wonderful tea with a sweet flavor that can be blended with more bitter herbs, so it makes a great addition to your pantry, and all the while you will be reaping the benefits of star anise. Buy your Star Anise Tea Today! Click on the image or on the links below to purchase from Starwest Botanicals your Organic Star Anise. Use organic Chinese Star anise to make a wonderfully spicy cup of tea. May this herbal tea be the cup of tea that is right for you!